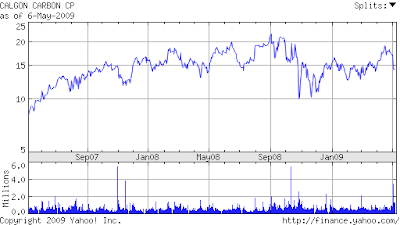 6/2 - A Senior VP at American Water (AWK) purchased 20,000 shares. Sounds great on the surface, but it comes a day after the company announced an offering of 26million shares, 11.5million of which was from existing shareholders (the parent company that IPO'd shares of AWK back last year). The offering would raise about $260million. AWK sits on a brutal pile of debt - at about $5.4 billion it is almost twice the company's market value. American Water's forward PE looks to be about 12, and it's dividend yield a nice 4.6% - however it's definitely not able to fund that dividend internally, as Free Cash Flow is consumed by enormous capital expenditures. 6/3 - A Calgon Carbon (CCC) director purchased 19,600 shares. FCFY (FCFY=free cash flow / market value) looks to be about 8% this year and next. I do like that insiders hold significant amounts of company shares. Potentially lucrative in this environment of coal regulation might be the company's "carbon absorption equipment." 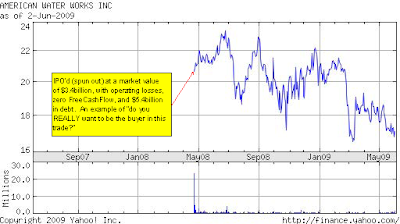 6/1 - An Aruba Networks (ARUN) bought 15,000 shares. Though the stock is sharply off its lows, it's still WAY off it's highs of a few years back. Profitability is very slow in coming.